You can view the grades for inactive and concluded student enrollments in the Gradebook. However, depending on the enrollment type, you may not be able to perform certain actions. 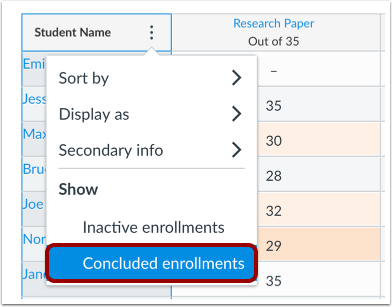 Learn more about enrollments types in the Canvas Enrollment Status Comparison PDF. For concluded student enrollments, all content in the Gradebook is read only and cannot be changed. 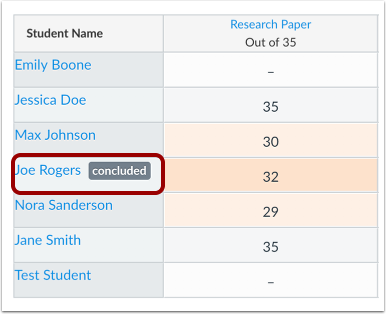 Grades can also be viewed when viewing concluded enrollments in the People page. For inactive student enrollments, grades can still be edited. However, inactive students cannot access the course, so they cannot view grades or receive any submission comments or feedback. Note: Inactive and concluded enrollments also show in downloaded CSV files and SpeedGrader assignment submissions. 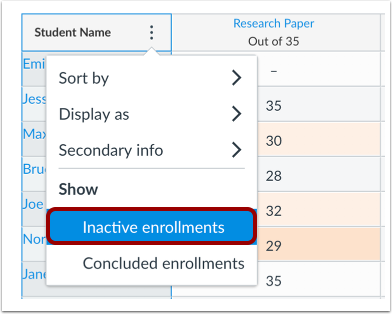 To view inactive enrollments, select the Inactive enrollments link. View the inactive student in the Gradebook. You will be able to edit the grades. However, the student will not able to access the course to view the grades or any submission comments or feedback. To view concluded enrollments, select the Concluded enrollments link. View the concluded student in the Gradebook. You will not be able to edit the grades. 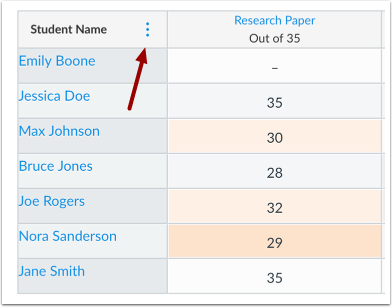 Previous Topic:How do I sort and display student names in the Student Name column in the New Gradebook? 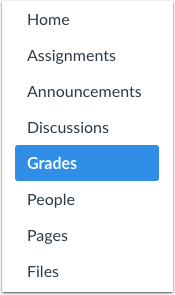 Next Topic:How do I use the Notes column in the New Gradebook? Table of Contents > New Gradebook > How do I view grades for inactive or concluded student enrollments in the New Gradebook?